If you were enchanted by Eat, Pray, Love, then you’ll be enthralled by the new luxury jewelry line Sweet Olive from designer Elizabeth Wimpress, inspired by her global travels. Sweet Olive 20-inch necklace ($1,375) created from crocodile leather, shagreen sharkskin leather links, buffalo bone, and a diamond-and-sterling-silver clasp. Wimpress returned to Dallas after a multiyear hiatus, during which time she wed, divorced, and saw the world. Her travels were a pilgrimage to find things of beauty and rarity. 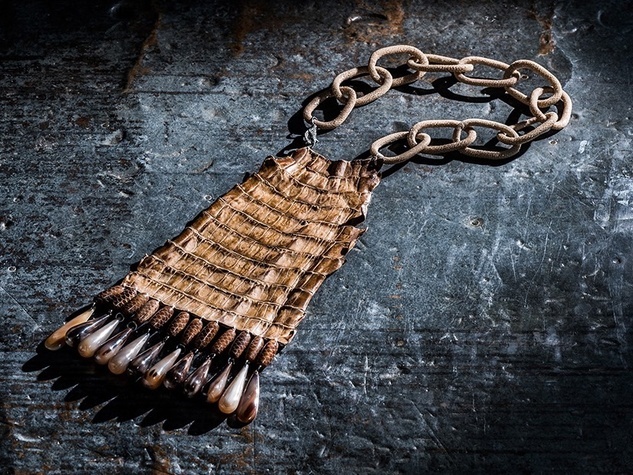 She visited Southeast Asia, Africa, South America, and Europe during her voyages, bringing back beautiful baubles, elegant stones, and inspiration for a new line of fashion-forward jewelry. 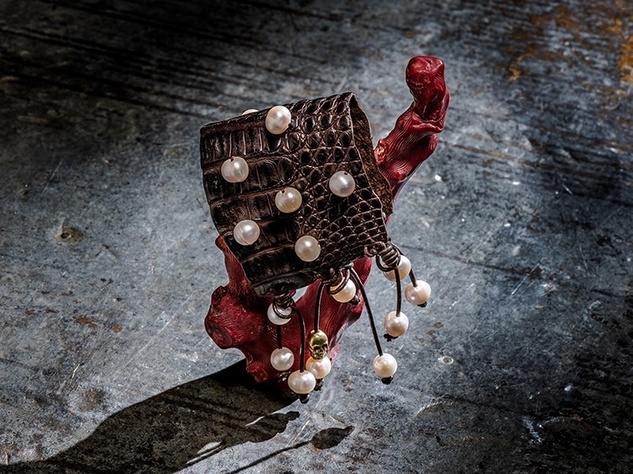 Handmade in Dallas, Sweet Olive pieces feature semi-precious stones and sparkly diamonds paired with exotic leathers, like alligator from Argentina; horn and bone carvings from the Philippines; South Sea pearls from Indonesia; and antique iron nails from New Orleans. Prices range from $500 to $3,500. "I think the woman who wears Sweet Olive is someone who really appreciates fashion and is chic, and who also has a little bit of a rock-and-roll edge to them," Wimpress says. "The range of the line goes from pieces that are wearable every day to more stately pieces." If Wimpress’ name sounds familiar, that’s because she was the designer behind Two Blonde Lizzards, a popular jewelry line carried by Neiman Marcus, Saks Fifth Avenue, and boutiques around the world. She pulled the plug on the line about seven years ago before moving to London. The time away provided fodder for her future work. "If you’re creative and come back to design after time off, your perspective is fearless," she says. "Sweet Olive uses a combination of things I would not typically have used before with [Two Blonde Lizzards]. Every piece is sketched and designed in Wimpress’ Dallas home. She oversees every aspect of the jewelry line’s production and creation, tweaking pieces individually until they’re exactly what she wants. She uses the same five artisans who helped her with Two Blonde Lizzards. "I chose [these artisans] years ago because they work with fine jewelry, hand-knotting between each pearl and using silk from Germany," she explains. "Plus, I get total control over the quality of every piece." Elements in Dallas just started carrying Sweet Olive, and others are sure to fall in line as Wimpress makes the rounds with trunk shows and exclusive viewings. "I’ve still got contacts in London and Paris, in addition to Dallas and New York. I’m picking key cities with specialty high-end boutiques, and I’ve hired back some of the same sales people as I had [with Two Blonde Lizzards]," she says. "My website just launched four weeks ago, and we're looking to be in more specialty boutiques, but my vision is not mainstream. I want to design without any boundaries."